It was not just the excitement of the first race of the twenty three-event NHRA POWERade Drag Racing Series that attracted international attention but the début of John Force's daughter Ashley in her first pro season in the seat of the Castrol GTX Ford Mustang Funny Car. The car made up the fourth machine in the Force stable and her initiation into the ranks almost overshadowed all else, it provided many memorable quotes and drama that would be hard pushed to be repeated by Hollywood's top screen writers. The southern Californian weather changed dramatically over the four-day race with cool overcast conditions turning into a warm sunny Saturday before holding up finals day with rain and considerably chilly, low fifty Fahrenheit degree temperatures. Top Fuel qualifying had three different names in pole position, Brandon Bernstein 4.494/331, Tony Schumacher 4.483/328 and Rod Fuller at 4.481/327 before Schumacher clinched it back with a final 4.472/331 clocking making it the quickest Top Fuel field in history. "How do you follow that 4.428" was the question that Tony Schumacher answered with "It was a perfect moment. We'll try to stay focused", but it all went away for him in round one as 'The Sarge' smoked the tyres in an on/off run against a jubilant Joe Hartley. 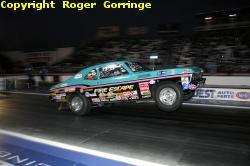 Larry Dixon also went out in a fight with Bob Vandergriff after some good qualifying passes. Cory McClenathan succumbed to new boy in the frame Whit Bazemore who took to the class like a duck to water. Other losers were Mike Strasburg to Dave Grubnic, Melanie Troxel to J.R. Todd, Doug Herbert to Rod Fuller, Hillary Will to Doug Kalitta and finally Alan Bradshaw to Brandon Bernstein. Round two opened with a close fought contest with Rod Fuller coming out on top with a 4.557/323 against Whit Bazemore's losing 4.564/319. 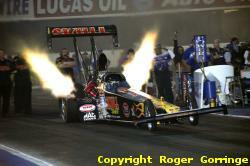 Doug Kalitta was beaten to the stripe by a wheel length as J.R. Todd wrapped up a 4.479/322 win to the 4.520/323 lose. Giant killer Joe Hartley suffered big tyre smoke at half track in his bout with Dave Grubnic, a 4.671/311 beat the 8.565/96. The other big spoiler of round one Bob Vandergriff got his comeuppance when his stout 4.580/317 was beaten by Brandon Bernstein's 4.512/329 to end the round. The semi finals were under the lights as the evening set in with Bernstein managing a good holeshot win over an on song all weekend Rod Fuller, the decision was a winning 4.496/326 to the losing 4.515/325 try. In an identical leave both Todd and Grubnic powered on until Grubnic lit the tyres and pedalled to a 5.399/248 lose as Todd ran the winning figures with a 4.473/324. JR Todd in the Skull Shine/Torco Race Fuels machine notched up his fourth Top Fuel career win with a fine holeshot 4.483/324 clocking leaving Brandon Bernstein to limp to an 11.397/71 as his Budweiser car unexpectedly lost power at one hundred and fifty feet out. 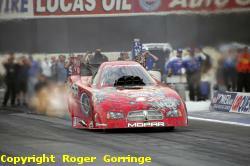 Funny Car provided more drama and excitement than any other class put together. Robert Hight despite suffering with the flu held pole position in the first three qualifiers with a fine 4.693/326 but was pipped to the post in the last session by Gary Scelzi's brilliant 4.692 at 333.49 mph. There were two new drivers in the class, a much heralded Ashley Force and Kenny Bernstein back in the ranks after an absence of eighteen years. Bernstein struggled with tyre shake and up in smoke passes in his Monster Energy Drink backed '07 Charger until a last ditch qualifier of 4.847/321 was attained but to no avail as it put him in twentieth position. Ashley Force managed a 4.810/281 in her first outing as her Dad struggled until his last qualifier gave him a 4.709/326 that bumped his daughter out, but she was right behind him and ran a 4.790/312 to get back in at number fifteen. Force senior told how his wife Lori berated him after his pass, "I can't believe you bumped your daughter out" - "but I told her I had a job to do", retaliated the team owner. It all ended prematurely for the Driving Forces as both suffered round one losses, John Force lifted off the power with problems against Cruz Pedregon and Ashley Force got crossed up after tyre shake and smoke at three hundred foot against team member Robert Hight. In an interview after Ashley said "I don't have a lot of experience yet of pedalling but Dad said blow up everything you need to get down the track but everyone on the team said don't listen to him, you don't want to catch yourself on fire"! Other losers in round one included Tim Wilkerson, Jack Beckman, Jim Head, Bob Gilbertson, Scott Kalitta and Tommy Johnson Jr. 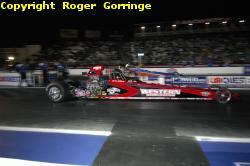 The second round opened with Robert Hight catching and passing Tony Pedregon's 4.825/290 with a 4.718/319 win. The third member of the Force team, Eric Medlen was the next to go out suffering shake and going out of shape slowing to an 8.564/91 as Gary Scelzi powered to a 4.752/318 win. Jeff Arend in the blue Checker Schuck's Kragen made his way past Ron Capps in a real tight battle, a 4.768/324 beat the 4.765/320. 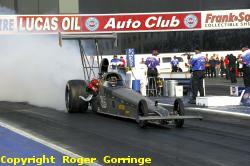 Cruz Pedregon suffered a flash fire under the car and slowed to a losing 5.553/173 as Mike Ashley also was plagued with problems but won with a 5.080/268. The semi finals provided some drama as Scelzi's chutes failed to unfold properly and his 4.690/331 pass ended up in the sand trap that necessitated a big clean up and a body change ready for the final, meanwhile Mike Ashley's 4.783/329 was not enough. Robert Hight managed to record the quickest ever Funny Car timing in history with his win of 4.646 at 326mph and stopped Arend's shaking 6.942/126 advance. The Mopar/Oakley Dodge Charger of Gary Scelzi was repaired by an army of helpers before facing Robert Hight in the Auto Club of California Ford in the final. Hight left first then drifted left just crossing the centre line at one thousand feet disqualifying his 4.72 time as Scelzi powered through with a winning 4.716/332 to take the event trophy. Pro Stock was initially led by Greg Anderson with a 6.647/208 then that was taken over by Allen Johnson's 6.640/207 before Anderson wrestled it back with a 6.634/209 to end qualifying. Defeated players in round one were Tom Martino, Kenny Koretsky, Warren Johnson, Max Naylor, Richie Stevens, Allen Johnson, Kurt Johnson and Jim Yates. 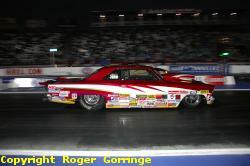 Into the second round went Greg Stanfield whose 6.671/206 beat the red light 6.723/206 from V Gaines. 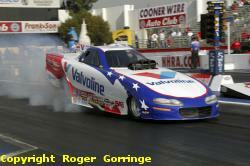 Dave Connolly managed a 6.655/207 win as new man Rodger Brogdon came off the power at two hundred feet. Jason Line got past Jeg Coughlin with a 6.722/207 to a slowing 7.240/149 and last in the round was the defeat of Mike Edwards' 6.725/205 by Greg Anderson's 6.640/208. Greg Stanfield got a lucky break in the semis when Jason Line red lit away his chances, a 6.676/206 beating the fouled 6.665/207. Greg Anderson carded a fabulous 0.004 light in his pairing against Dave Connolly coupling that with a winning 6.651/207 to the losing 6.670/207. The finals pitted the Summit Racing Equipment Pontiac GTO of Greg Anderson against the Piranaz Racing Pontiac of Greg Stanfield but Anderson caught and passed the slight leave from Stanfield gaining a winning 6.651/207 to the losing 7.001/163. Top Alcohol Dragster saw the win going to Brandon Johnson in a flurry of loose contingency sponsor decals as they flew off the car on his 5.405/267 pass against the troubled losing slowed up 21.170/59 timing from Mark Niver. Top Alcohol Funny Car had Jay Payne take the honours with a 5.779/249 as opponent Sean Bellemeur hit the centre line timing blocks and was disqualified. 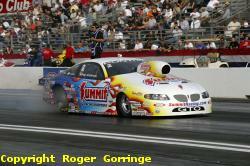 The Super Comp win was taken by Tom Yancer, he beat Justine Jeffrey in an 8.930/170 win to the 8.899/171 lose. Super Gas saw Randy Fabbro take his '67 Nova to the class trophy with a 9.908/153 as opponent Fred Kondrotas broke out with a 9.895/147. 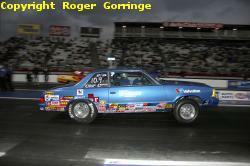 Super Stock win went to Jody Lang in the '81 Malibu with a 10.900/114 win to the 9.055/150 from Jimmy DeFrank. Stock Eliminator was taken by Clark Holroyd in his '68 Nova, his 10.426/123 beat the 12.084/105 from Tibor Kadar.